Separate bedroom with a queen size bed and a living room with a bed sofa make it a perfect stay for either a family of four or friends of four. The apartment is light and has a large French balcony. The kitchen is fully equipped with dishwasher and coffee maker. Feel free to use the washing machine if you need to wash your clothes during your stay. I left some instructions but you can reach out if you have any more questions of course. My name is Hedvig and I am born and raised in Stockholm. I love traveling and experience new places, meet new people and cultures. I have been in in the service and hotel business for a fairly long time as my family own a mansion and hostel on the island of Gotland where I have been helping out with the rentals. I really want you to experience the best of Stockholm and will make sure to give you tips on the "must see", my favourite restaurants in the area and where to shop. In short, I will do my out most for you to get the best out of Stockholm during your stay. The property is situated on the beautiful and calm street Erik Dahlbergsgatan - close to Karlaplan and the vibrant Östermalmstorg. 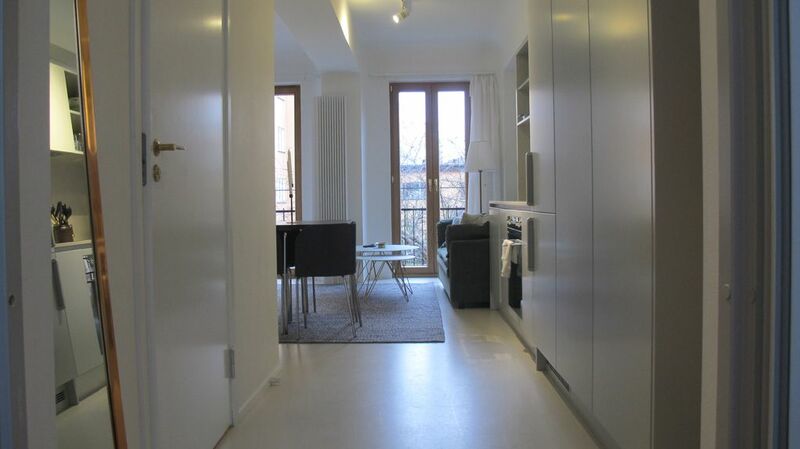 The apartment is bright with a long French balcony, newly renovated with brass details in kitchen and bathroom. The area is green with parks and close to the waterfront and the Royal Djurgården. The building it self has a very hotel like feeling as not only the apartment but the whole house was newly renovated just 2 years ago. Location is key when you come visit a city and I really like how the apartment and area manage to offer both the calmness and green areas along with a closeness to restaurants, clubbing and shopping. The bathroom is newly renovated with brass details and has white tiled walls and floor. Equipped with a WC, sink and shower and a washing machine and dryer. Calm area close to Karlaplan (5minutes walk), Close to The Royal Djurgården and also close to metrostation Karlaplan (Red line). Östermalmstorg is one stop with the metro away or 20 minutes walk. About 15 minutes from the apartment is Strandvägen and the beautiful walk along Nybroviken. One can also take a walk around Djurgården; perfect for morning walks or jogs. Basic pantry items needed for cooking such as oil, vinegar, coffee, tea, salt, pepper etc. Kitchen utensils, pots and pans and plates/cutlery. All essentials for guests to make own food during the stay. Dining place for four. The kitchen is fully equipped with a hob and fridge, kitchen utensils, pots and pans and plates/cutlery. All essentials for guests to make own food during the stay. The apartment is tastefully decorated and well suited for you travelling as a couple or family/group. The kitchen enable you to cook your own food if you don’t feel like eating out all meals but if you do; there is plenty of good restaurants in the area! The apartment is located close to shopping center Fältöversten that offers shopping, grocery stores, alcohol shop "Systembolaget", pharmacies and restaurants/cafés. If one is looking for more shopping and food experiencies; vibrant Östermalmstorg is 20 minutes walk away (or one stop with the metro) were you find "Östermalmshallen", a few of Stockholm's most iconic restaurants such as Prinsen, Riche and Sturehof and also shopping; both main stream and high end. The area in which the apartment is situated is calm and green with nearby parks for walks or jogging, also fairly close to the waterfront and the Royal Djugården. It is easy to reach the apartment as it is only two stops away from the City central with the metro (takes about 7-10 min). To travel to Old town is either 15 minutes by metro or 30-40 minutes walk - I highly recommend walking if the weather allows it as it give you a wonderful view of Stockholm and the waterfront.